Synopsis : Photographer and artist Anne Geddes shows us thought provoking portraits of children who have lost limbs to meningitis. Amber Travers (5), Ellie-May Challis (9), and Harvey Parry (8) will appear, alongside their families and other children affected by the disease from around the world, in a new e-book for the Protecting Our Tomorrows campaign, to be launched on World Meningitis Day, 24 April 2014. The inflammation of the membranes that surround and protect the brain and spinal cord. These bacteria usually live harmlessly in the back of the throat. Most of us will carry them at some stage in our lives without becoming ill, and they help us build up natural immunity (protection against the disease). Occasionally, these germs get past the body's defenses and cause infection. Symptoms include fever, vomiting, severe headache, rash (not present in all cases), stiff neck*, dislike of bright lights*, very sleepy/vacant/difficult to wake, confusion/deliriousness and seizures (fits). *Unusual in young children. Other symptoms in babies include a tense or bulging fontanelle (soft spot on the head), refusing to feed, being irritable when picked up with a high pitched or moaning cry, a stiff body with jerky movements or a floppy and lifeless body. Meningococcal disease is the leading cause of bacterial meningitis in the UK and Meningitis B accounts for the majority of these cases. There is currently no broadly available vaccine for Meningitis B in the UK. Amber, five, from Croxteth, Liverpool, is the youngest child to be photographed by Anne Geddes. Amber lost her legs and arms after contracting the disease aged two. She is pictured with her sister Jade. The project makes use of Anne's famous photographic skills to capture the beauty and innocence of childhood with the dreadful impact of meningitis in a way which is both compelling and unsentimental. Anne said: "As a mother and passionate advocate of children, I want to empower parents to understand meningitis and know how best to protect their children. You only need to look at Amber, Ellie and Harvey to understand the impact of this devastating disease. It really would be your worst nightmare to see any child go through such an ordeal. "But at the same time, these children and their families are overcoming huge obstacles to rebuild their lives and these beautiful pictures capture their strength in the face of adversity." 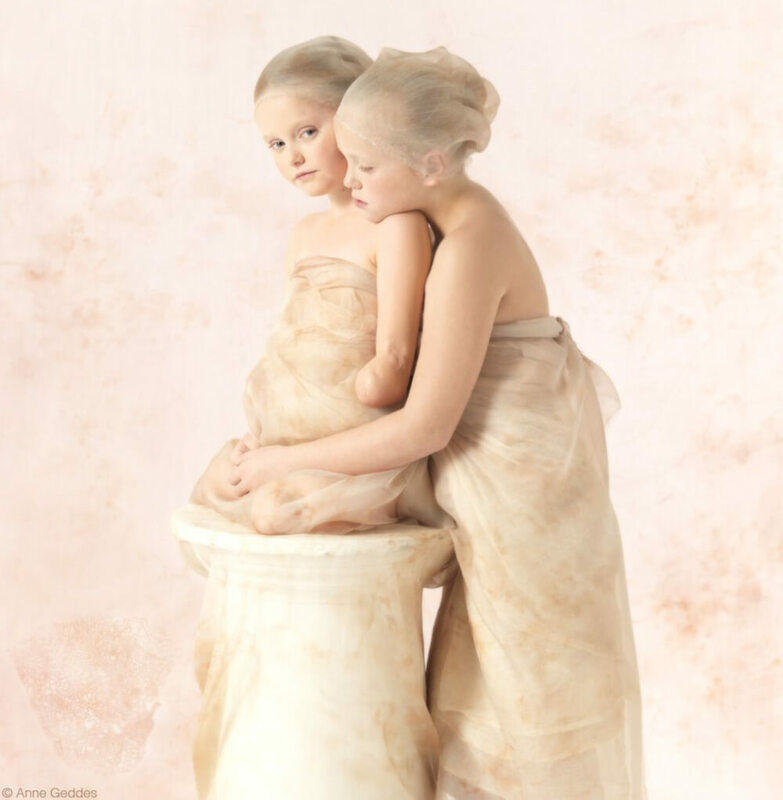 Amber, who lost her arms and legs after contracting the disease aged two, was the youngest child to be photographed and appears alongside her sister Jade, aged eight. Ellie-May Challis lost her lower legs and arms at 16 months and is photographed with her twin sister Sophie. Harvey lost both his legs and part of his hands just one week after starting to walk, and is now a successful athlete running on blades. Protecting Our Tomorrows is a global campaign, led by the Confederation of Meningitis Organizations (CoMO) and supported in the UK by Meningitis Now, Meningitis Research Foundation and Novartis Vaccines and Diagnostics Limited. Through the use of thought-provoking and inspiring photographs captured by campaign ambassador Anne Geddes, the project will highlight the impact that this sudden, aggressive disease can have on survivors and families. Ellie-May, nine, from Little Clacton, Essex, lost her lower legs and arms after contracting meningitis at 16 months. She is photographed with her twin sister Sophie. Bacterial meningitis is the leading infectious killer in children under five and strikes 3,400 people every year in the UK. The majority of these cases are caused by Meningitis B, which accounts for around 55% of all bacterial meningitis and septicaemia cases. Up to one in ten of those who contract meningitis will die and many survivors are left with life-long after-effects, including amputations. Vaccination is the most effective way to prevent and control bacterial meningitis, however children in the UK are not routinely protected against all types. Commenting jointly on the campaign, Meningitis Now and Meningitis Research Foundation said: "Anne Geddes has delivered a unique and creative approach to a disease we have spent years fighting. Too many children face death and disability from meningitis every year. We hope these stunning portraits will raise awareness of the disease, its symptoms and the impact it has on thousands of families every year." In addition to Amber, Ellie-May and Harvey, children from Australia, Canada, Germany, Ireland and Spain will also feature in the e-book. Harvey, eight, from Enfield, Greater London, lost both of his legs to meningitis just one week after starting to walk. Harvey is now a successful child athlete. 5. World Health Organization. Meningococcal Position Paper. Weekly Epidemiological Record No. 40, 2002, 77, 329-340. Available at: www.who.int/immunization/wer7740meningococcal_Oct02_position_paper.pdf. Accessed January 2014.